I have a huge list of things I love about summer. Here in upstate New York, we live for summers, because they’re so beautiful, and we can be outside as much as we want to. Going to the beach, bonfires, BBQs, swimming, picking berries, hiking, camping, 4th of July, travel…I could make my summer list as long as my arm! I also have a list of favorite summer things–everything from decor to shoes to pillows–and I thought I’d share them with you! Affiliate links are included below. If you click on a link and make a purchase, I receive a small commission that helps support this blog at no extra cost to you! 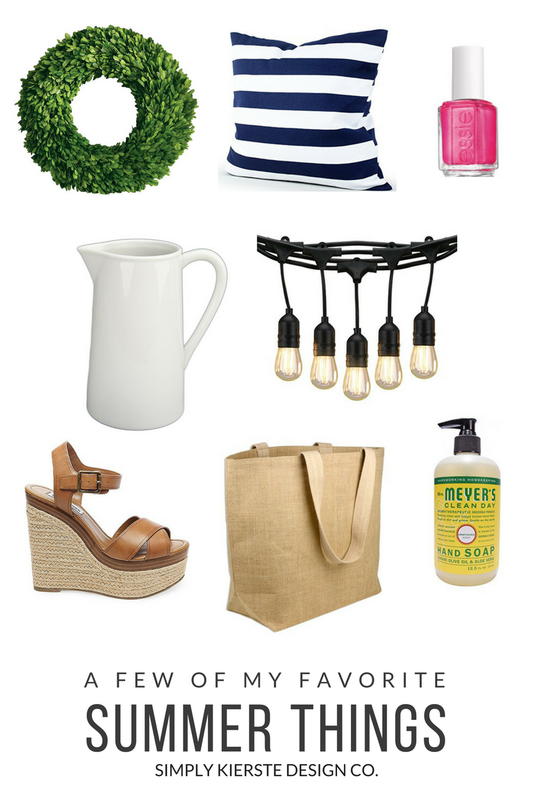 How adorable is this beach tote? It works for the beach, shopping, traveling, or when you need a big bag filled with stuff for the kids. I’m so fair-skinned that sunscreen is one off my most important summer staples. I love this dry-touch sunscreen–it goes on smoothly, and rubs in nicely. I can wear it on my face, or anywhere I need extra coverage Great for kids too! I adore a good white pitcher, and I have several of them. Fill it with any of your favorite summer flowers or greenery (I snip them from my yard), and you’ve got the perfect summer centerpiece or decor for your home. Mrs. Meyer’s is my favorite hand soap (I actually love all of their products), and this yummy honeysuckle scent just speaks summer! This summer we put up outdoor string lights around our patio, and they make me happy every time we turn them on. I just love sitting outside with my family or friends, enjoying the night air and watching the fireflies. They’re perfect for eating or hanging out on summer nights, and really make a space so fun. I actually included this on my list of spring favorites as well, and it will probably be on the one I do for fall too. Boxwood wreaths are extremely versatile, are perfect for all year-round, and work for every season. In the summer, greenery is the perfect accessory, and this wreath looks great in any room or on your front door. I think navy is the best summer color. It works for the patriotic holidays, but it also is so crisp and clean. 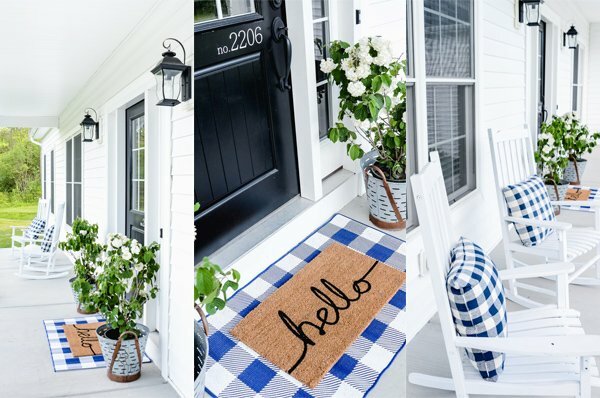 Nautical themes ARE summer, and navy and white just may be the perfect color combination there is! I like to use pink polish on my toes a lot, and while I’ll go more pastel in the spring, summer is the time to go bright! Pink is a great neutral for summer, but still packs a lot of color, and looks great with all of your sandals and open-toed shoes. I’m kind of obsessed with shoes in general, but I especially love wedge sandals. This pair by Steve Madden is a new favorite, and they look adorable with jeans, pants, skirts, dresses…everything!